There is a notion made by many that buying a house is always better than renting. “Why pay someone else’s mortgage?” is the question that comes to mind whenever someone makes an argument about buying versus owning. Those in America who have suffered through the housing crash would probably disagree with the above statement that owning is better, especially the individuals who still find themselves with negative equity in homes they can’t sell. Crashes and bubbles aside, sometimes it’s just the easy things that tell us that owning is not as good as renting. How can this be so? “My parents have always found it better owning a house for life! Why will it be different for me?” Well the fact is there are some easy tell tale signs that tell you renting is better and you don’t need any financial acumen to determine that. Maybe just grade 2 math. I hope you can handle it. 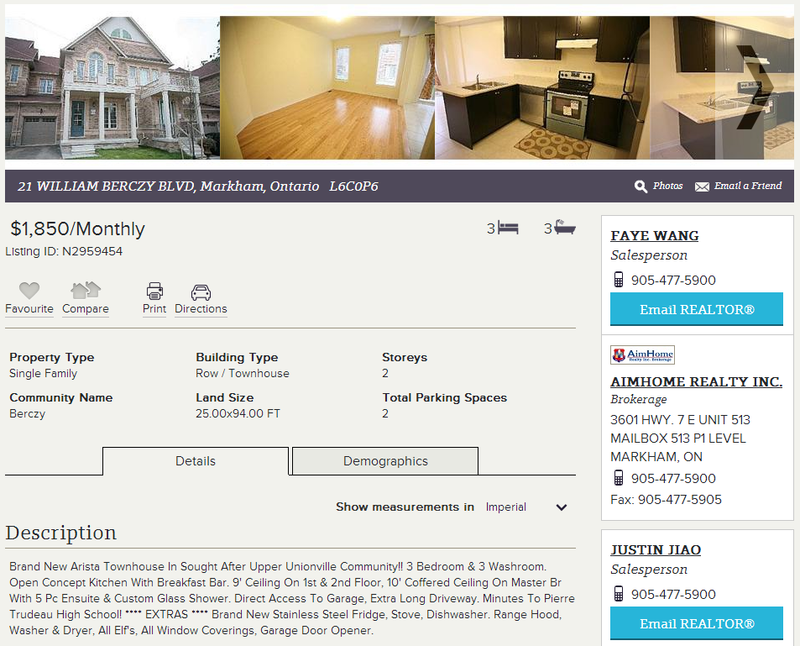 An example can be drawn from a real estate listing in one of the popular suburbs of Toronto, Markham. There has certainly been a lot of talk about Toronto and Vancouver being an extremely expensive place to live in Canada, but the cities surrounding Toronto are just as expensive. 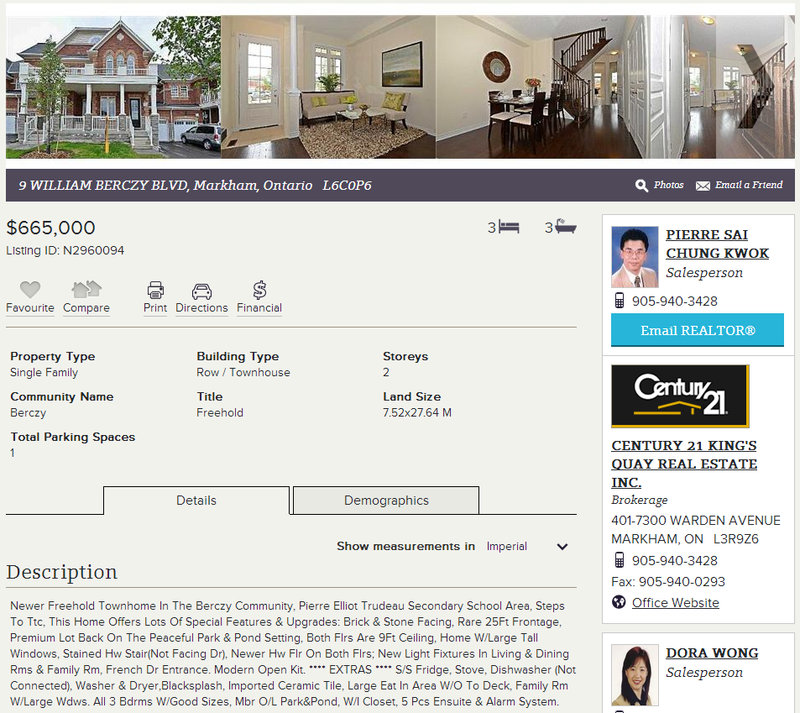 See the listing below of a townhouse in Markham, which requires almost a 1 hour commute to downtown Toronto. It’s an almost brand new home townhouse with 3 bedrooms and 3 bathrooms asking for a princely sum of $665 000. The price might seem quite astonishing, but Markham just might be Canada’s 3rd most expensive city (sorry Calgary). So what does a monthly payment look like for a buyer who can afford to put a 20% down payment and amortize over 25 years? 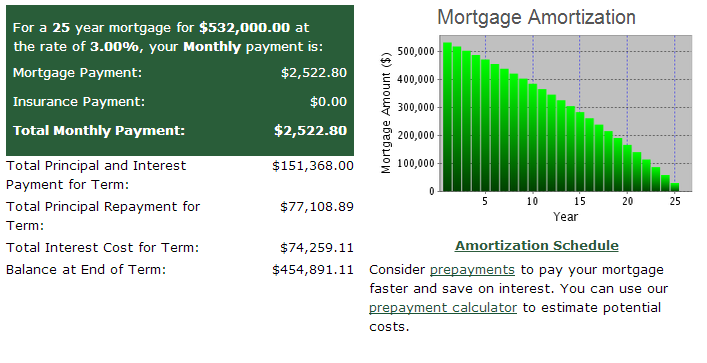 With an extremely low interest rate of only 3%, the totally monthly payment only equates to $2522.80. It’s quite a reasonable amount for buying a home. The mortgage contract calls for a 5 year fixed rate at one of Canada’s most stable bank. An individual making payments over those 5 years will end up saving over $77 000 in equity into their home. So what about interest payments? How much of the payment goes to interest? Let’s take a look at the amortization schedule for the first 12 months of payments. What the chart shows is of the approximately $2500 that is paid towards the house per month, $1300 is used to pay interest to the bank. This is money that the home owner will never ever see again. It’s not surprising that so much goes to the bank. This has already been outlined before on how mortgages work. One of the benefits of living in a house out in the suburbs is the ability to enjoy having a backyard to host guests and the abundance of green space to raise families. Unfortunately, the sprawled out nature of these suburbs incur a hefty cost. These costs are passed down to home owners through high property taxes. It’s no surprise then, that homes like these in Markham have property taxes near $350 a month (source: City of Markham). This is also a cost that a home owner will never get back. A new home such as the one above should require a home owner very little to fix up; however, regular maintenance of the home is necessary. Any current home owner could probably tell you that upkeep of a home on a regular basis costs money. Even if things don’t need fixing, a home maintenance fund should be set up to account for the situations that arise that might require additional money. How much should this be? It’s hard to gauge, but for this exercise we can forget about it. I’m trying to be totally biased! For just the obvious simple costs, a home owner would have to pay roughly $2850 a month to keep the home. From that amount, $1650 will never be seen again by the person who decides to purchase the home. That’s right, that home owner is throwing away money to the government and the bank, not “someone else’s mortgage”! If buying that home is so expensive, no doubt renting one just like it must be even more expensive. That assumption could not be more incorrect. See the real estate listing below for a home just a block away in the same neighbourhood. For $1850 a month, an individual can rent out a brand new town house that sits just a few houses away from the listing above. Want a brand new home? Check. Want hardwood floors? Check. Want stainless steel appliances? Check. The shrink wrap probably hasn’t even been taken off the stainless steel appliances in the kitchen! That $1850 is something that a renter will never ever see again, but what about that 20% down payment that a home owner had to make? Well that’s money in the pocket of the renter now. Even the most conservative of investors throwing their money into a GIC for 5 years can make 2.55% compounded annually on their money (source: Tangerine). That’s the equivalent of earning $3391 on the $133 300 after the first year or $282 per month. As a renter, what does the person have to pay the government and bank? Nothing. In fact the renter is making interest money from the bank. With the extra income, the amount of money the renter is losing per month then is only $1568 per month. 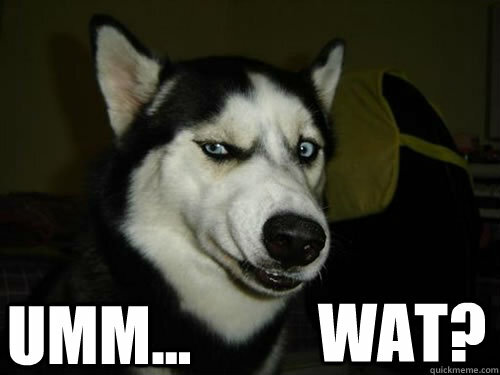 As for the notion of paying the owner’s mortgage? Well, you might be subsidizing a bit, but the reality is, the owner is paying out of their pocket for the privilege of you living in their new home. What about maintenance and upkeep of the home? Nada! That’s the home owner’s responsibility not the renter’s. I will admit the math isn’t at a grade 2 level. I had to do some multiplication using percentages so perhaps someone in grade 5 might find it easier to understand. What is astounding is that the amount of money being tossed away by the home owner is more than the renter even when the home that is being compared is essentially identical. So does it really make sense to buy? Certainly capital gains on each side have not been considered in this example. A renter most likely would not put all their money in a GIC, but in this example it makes sense because the principal is guaranteed. Likewise there could be potential gains on the house over the coming years, but from a straight numbers to numbers standpoint renting is cheaper. Let’s not forget one other important factor in that a renter only has $1850 tied to housing on any given month. A home owner needs to be able to come up with $3200 a month. This is a large difference that shouldn’t be ignored. A home owner might be able to afford that type of payment every month, but it would certainly put a large dent in their free cash flow. Such an individual may essentially make themselves “house poor” just for the peace of mind of owning a home. The next time someone tries to convince you that owning is better than renting, maybe you should point them to this article. It’s always fun to make someone else eat their own words. Or maybe tell them that they enjoy paying the government and corporate bankers more. That will shut them up.